A software application for remote wireless access in real time to a comprehensive set of medical data is being developed. 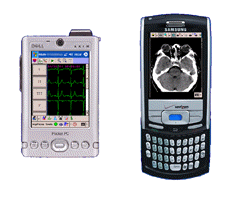 A wireless mobile pocket device will allow access to all data, including viewing radiographic imaging connected to the PACS system. 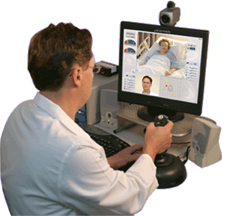 The entire medical electronic record can be accessed remotely in real time. New high-speed cell phone networks are employed. This technology will be fused with the InTouch robot for virtual physician presence at the bedside, in the Emergency Room, or on the battlefield. It will allow for remote expert consultation, with the ability to view the patient, interview the patient, and assess a complete set of medical data in real time. Yulun Wang, PhD, CEO, InTouch Health, Inc.
Hu X, Buxey F, Barry T, Nenov V, Martin N. "Use an Automated Multi-Scoring System to Assess Patients with Unplanned ICU Admission." 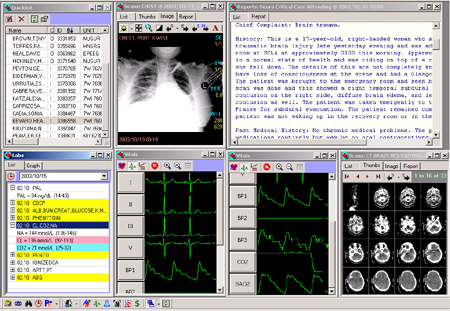 2008 Annual Healthcare Information and Management. Systems Society (HIMSS) Conference. 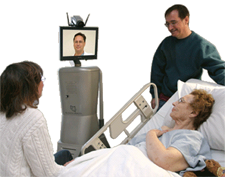 Vespa P, "Robotic telepresence in intensive care improves physician response time," Medicine Meets Virtual Reality 15: in vivo, in vitro, in silico: Designing the next in Medicine, Long Beach, CA, 6-9 February 2007. Vespa, P, Miller, CM, Hu, X, Buxey, F, Nenov, V, Martin, NA. 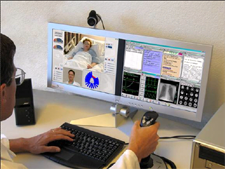 "Intensive care unit robotic telepresence facilitates rapid physician response to unstable patients and decreased cost in neurointensive care," Surgical Neurology. 2007 Apr;67(4):331-7.